► How to open a .ZIPX file? What is a zip file and how do I open a zip file? ZIP files are classified as archives of files and folders (or even entire file libraries or directories with sub directories) that have been encoded using the data compression specifications implemented by the ZIP file format. These ZIP files allow users to reduce the size of files and folders that they want to store in their external data storage devices. Many users prefer to send multiple files via attachments to their emails as ZIP archives. Some file compression and decompression tools for Microsoft Windows are implemented with support for creating and decompressing these ZIP files, and there are also programs for Linux and Mac platforms that can be used to create, decompress and access the content of these ZIP files. Each file in a ZIP archive is separately compressed using ZIP encoding specifications, thereby significantly reducing the resulting size of the ZIP file. WinZip software is recommended for opening and creating zip files. WinZip extracts content from 25+ files types, including Zip, Zipx, RAR, 7Z, TAR, GZIP and more. It also offers 128 and 256-bit AES encryption, PDF conversion, image resizing and file splitting for large archives. WinZip supports multiple sharing options, including email, social media and cloud services. 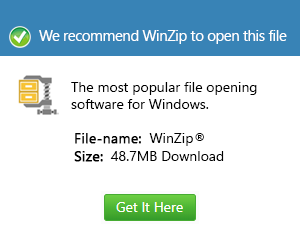 WinZip software is recommended for opening and creating zip files on a Mac. WinZip extracts content from major compression formats, including Zip, Zipx, RAR, LHA, 7Z, JAR, WAR and more. It also offers 128 and 256-bit AES encryption, eases file sharing between Mac and PC users, and makes packaging and sharing files more efficient.